Ceci Wolfe writes whatever her characters tell her to write. A Harvest of Stars is realistic fiction about two teens dealing with abuse in a small Kentucky town. Throne of Grace is the first in a series of historical inspirational romances set in beautiful turn of the century Newport, Rhode Island. Reckless Treasure is a contemporary drama/romance retelling of a little-studied Henry James classic. That Night is about teens dealing with the heroin overdose death of a close friend. Her stories have been published (under a different name) in a variety of literary journals. 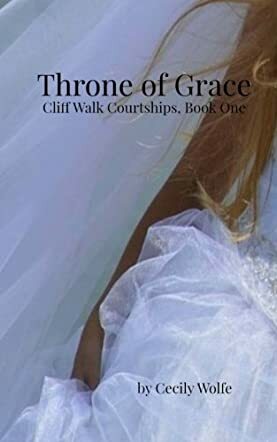 Throne of Grace by Cecily Wolfe is a story of love and trials between a man of wealth and a girl of servitude, a pairing that just was not done in 1893 between the different classes. Josie, a house maid in the Davenport mansion, falls in love with Arthur, the only Davenport son. Their faith and desire to serve God initially draws them together while his family and the community itself try to end this ridiculous union. Arthur is supposed to follow his father into business and marry whomever his parents, especially his mother, deem a good match. This, of course, means money, name, social standing and such things. Josie, well, she will marry whoever will have a girl like her. As Josie and Arthur’s friendship grows stronger, their bond and commitment grow as well. Love is the inevitable outcome, but to stay together will come at a cost. Not just for them, but for Josie’s mother, Lucy, as well. Is this really what God wants or are Josie and Arthur both caught up in the excitement of helping others or a need to defend each other as good friends? Could a couple from such different backgrounds and stations in life ever be happy together, and will they have to choose which world they live in? They will need to rely on each other as they wait for God to show them what He wants. Cecily Wolfe tells a familiar story with the added benefits of knowing the spiritual and emotional aspects of the characters as well. This is a well written, smart, tender and engaging story that draws the reader in and makes it hard to put the book down. Wolfe has captured the essence of young love and the torment of prejudice due to old ideas of an upper and lower class being able to define the value of individuals. Wolfe’s descriptive writing and command of language make this an interesting and thoroughly enjoyable read. Wolfe has given us Josie, a servant girl trying to “discern the difference between romantic love and the love of friendship,” an issue still relevant today. Wolfe touches on many topics that are dealt with daily, and offers words of wisdom and encouragement to inspire wise decisions. Prayer is a constant theme that supports her characters and shows us the depth of their commitment to God, even before their commitment to each other. Cecily Wolfe delivers a lovely, well written, well thought out love story with much deeper life lessons sprinkled throughout. When I read the description of author Cecily Wolfe’s book “Throne of Grace” it sparked my interest from the beginning as I’m a romantic at heart and I love watching and reading about historical romances. I wasn’t disappointed! This is definitely a story that presents the grace of God. There is so much Godly instruction and wisdom immersed throughout this book. Our main character’s Arthur and Josie are socially and economically worlds apart and would not have intermingled or developed a friendship under normal circumstances. Author Davenport is from an extremely wealthy and respected family, whereas Josie is the Davenport’s house maid and at an economical disadvantage. Arthur has found a new found freedom in Christ and no longer desires to live for wealth and himself. Although this change is good- he finds himself feeling disconnected and no longer interested in things that once made him happy. He realizes his life was self absorbed and he desires to use the privilege allotted to him to help the unfortunate. His desire to help goes beyond charitable contributions. Instead, he no longer has interest in the lucrative family business and desires to work hands-on in a non profitable community based outreach. This decision and passion ostracizes him from those in his circle. He finds himself attracted to and drawn to Josie’s faith in God, although his pursuit of her is not in the favor of his parents and circle of friends. Will Arthur and Josie’s love stand the test of time? This historical romance teaches the lesson that we are valuable in the eyes of God regardless of how society or others may view us. Sometimes opposites do attract as was the case for Arthur and Josie for a purpose only God could have set in motion. God does work in mysterious ways as you’ll experience in this book filled with twist and turns, courage, faith and love. I especially love that at the conclusion of the story the author shares what she believes to be modern love songs that describe the love experienced between Arthur and Josie.